This three-video set is a supplemental tutorial for high school or college students tackling the most difficult and challenging Intermediate Algebra questions. Presented by a video professor, this course explains an assortment of algebra problems in detail on a chalkboard in an easy-to-follow approach. 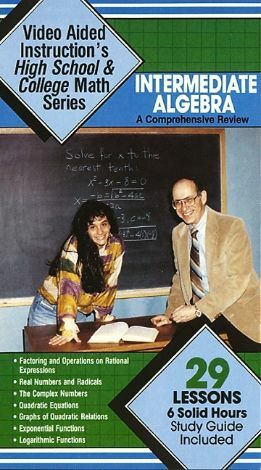 The topics reviewed include rational numbers, real numbers and radials, relations and functions, exponential functions, logarithmic functions, complex numbers, quadratic equations and graphs of quadratic functions. This program is also an ideal learning tool for adults who wish to refresh their mathematical skills by studying the material at their own pace. A study guide is provided to supplement this video tutorial.